This seems to be KZGX Watertown MN, following a message today on KOJE about switching from Spanish to Hmong. Yes, Hmong. Hannu Tikkanen commented this in an email: "Hmong...There must be a huge potential of audience of foreign workers in Watertown area...Next Portuguese, or Chinese... " In all fairness though, Watertown is in the western outskirts of Minneapolis which probably has a larger Asian audience. An interesting day! Not too much during the night, but some nice signals in the morning, KBSN-WA 1470, KSWB-OR 840 and KXMG-OR 1150 to name a few, also heard CJRJ Vancouver BC 1200 testing with indian music (also heard yesterday). Tahiti heard 0730; Tonga, Marshall Islands, Fiji surfaced around 0900, then from 1000 to 1200 strange things happened on the upper part of MW: First, the 100 watt NHK1 stations dominated 1584 and actually gave call IDs at 1000 UTC (probably one or more Hokkaido stations), then on 1557 at 1100 JOHS Rumoi, another 100 watt station gave 300,000 watt Family Radio, Taiwan stiff competition, nice HBC ID on the hour! Almost as strong as its mother on 1287! Most likely also heard AFN Japan on 1575. This will be my last update for a while - I am heading for Reykjavik, Iceland Wednesday morning and will return late Sunday. Tore and Torgeir will stay until Thursday morning. Ah - yes. 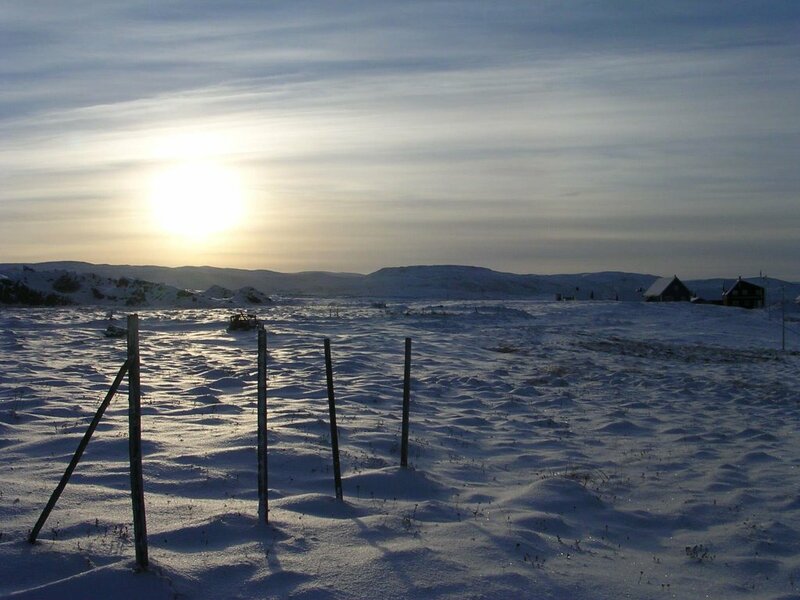 Not much to report from my end, I drove to Berlevåg Sunday evening and spent the night and Monday there to prepare for Wednesday's trip to Iceland. When I left Kongsfjord the sky was clear - but not black, green! Most of the sky was covered with Aurora. Good for Japanese couples who believe in the Aurora as a fertility booster (I didn't see any); bad for us. Still, the rest of the crew heard some North Americans during the day, and Tonga 1017 plus many Asians in the afternoon. In the evening we went to the guesthouse for another fabulous dinner. 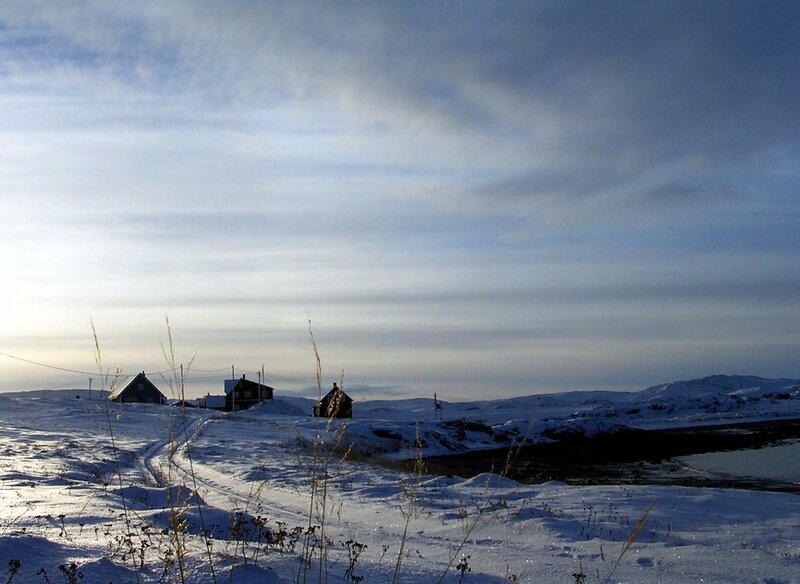 No Aurora visible tonight, and as I write this weak signals on 1230 (Iqaluit, NU) and 1500 (probably Detroit). The Coronal Hole did make a huge impact... very little heard from North America, mostly west coast stations and only the dominant ones. Not much from Asia either, but surprisingly enough Fiji Radio 2 on 1467 has had a stable signal for most of the day. 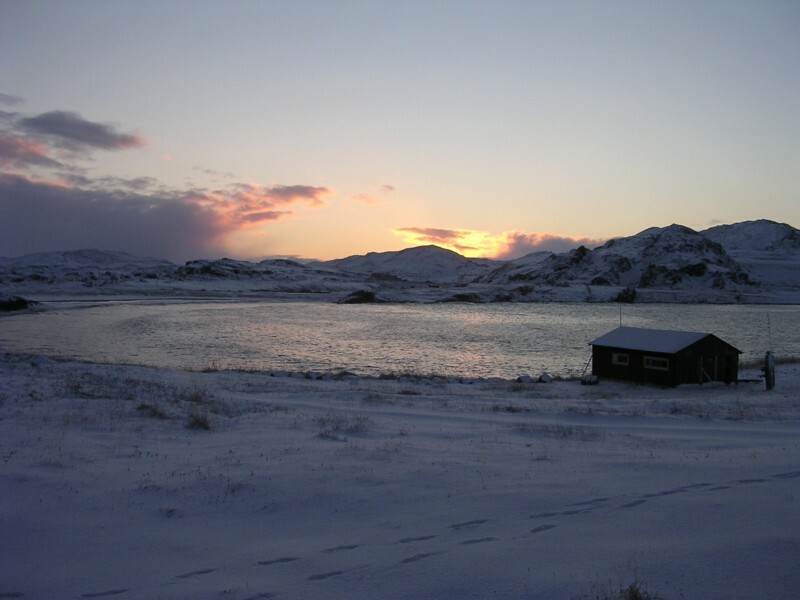 But on to THE BIG NEWS: TWO NEW PACIFIC COUNTRIES TO REACH KONGSFJORD! The superb Pacific opening starting around 0900 UTC on the 27 brought Radio Nouvelle Caledonie 729 from 0956 until a few minutes after 1000, mixed with JOCK Nagoya Japan. Apparently local talk until 1000, French time check as "20:56", France-Inter news at 1000 and possibly a local weather report at 1005. Another new country is Micronesia, V6AK with a steady albeit weak signal for more than an hour under NHK2 on 1593, lots of island music, English commercials noted at one occasion. No exact ID so formally maybe it should be regarded as tentative, but there are no alternatives. A third prospect, Wallis & Futuna, was hunted on 1188. Unfortunately we only heard France-Inter so there is no way of determining that it really was them, although there appears to be no other French stations on 1188 except Russia relaying Radio France International. And finally, Tahiti 738 was confirmed having local programming prior to 0700 UTC. A large bouquet of virtual flowers goes to Jean Burnell for taking the time to work on the three French-speaking prospects! 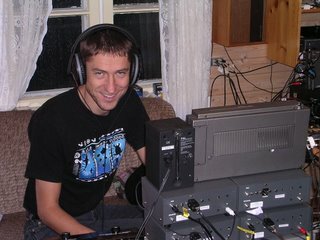 Not only did he listen to the recordings, but did a lot of investigation, listening to web streams etc etc. Thank you so much! Weather: Calm and clear, -3C. Heard that before? The day started off prior to 0100 with some interesting signals - some Wisconsin stations had really huge signals such as WIBA 1310. What puzzled us was a station on 1600 with Asian popular music and announcing "You are listening to Radio Free Asia" just after 0100. Suggestions are welcome. Definately not KVRI-WA. As morning came conditions went "deep", with several Mexican stations audible. I also monitored 738 in case Tahiti could be heard before they went into the France-Inter relay at 0700. Lots of CBX Edmonton slop so I wasn't very optimistic but as luck would have it the NA signals took a deep dip after 0645, and at 0658 I did in fact hear audio from Tahiti. Too early to tell if it was local though, the signal was exceptionally weak. Not much NA after that, but after noon signals from Hawaii were excellent, and we also heard Fiji 1152 very strong at times. 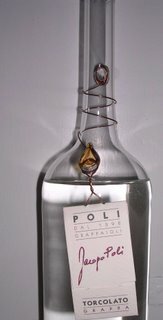 There were traces of Fiji on 558 as well. Weather: Light to moderate NE winds, partly cloudy but occasional rather dense snowshowers. They tend to cover the band with noise as well, so the less snow, the better. 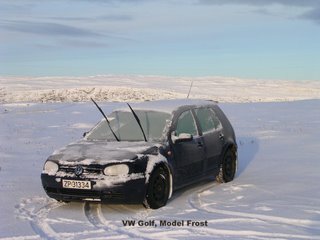 Around -3C. Another good day for the KONG16 crew. No typical daytime conditions last night, but a couple of interesting stations were heard prior to 2400 UTC, apparently with daytime powers. More investigation is needed. Generally good signal levels throughout the night, stations like WDTW-MI 1310, WRKO-MA 680 (rare here) and KBSN-WA 1470 were noted. NA signals faded out around 1300 UTC. Tried for Tahiti 738 with local programming prior to 0700, but only Spain heard. An hour later I re-checked - and the band was alive with Pacific! Samoa 540, Tahiti 738, Kiribati 846, Tonga 1017 and V7AB 1098 all with superb signals! Fiji 1152 followed. Also NZ on 1035 noted, and Radio Sport, Wellington 1503. I spent an hour on 1593, and there is reason to believe that the effort has paid off, although at this stage it is too early to conclude. However, the terms Island Music, 1593 and Micronesia are good matches! A couple of other UNIDs will remain so until further notice. The Pacific signals were unfortunately soon lost to the Asia mainland powerhouses though. Two nice NHK1 stations were logged while actually hunting for Pacific; JOCK Nagoya 729 and JOKP Kitami 1188, both superb signals. It will be interesting to see how much influence the current Coronal Hole will have. At the time of writing, the outlooks are good. Weather: Calm, partly clear and -3C. This has been the least windy autumn here that I can remember. The KONG16 crew arrived 10 hours late yesterday due to flight cancellations, so not much DX until morning. Good signals noticed around 2330 UTC though - next in the log was 0300. Generally good signal strengths throughout the night with stations like KSJB-ND 600, KOVE-WY 1330 and presumed KDIO-MN 1350. From 06 to 07 conditions faded but apparently only to regroup, the rest of the day good DX from the western part of North America. KLTX-CA 1390 good signal for many hours, KMED-OR 1440, KIXI-WA 880 and others. Also Alaska fine, like KRSA 580. Late in the day as sunsrise was getting close for the west coast, tentative loggings of KUTY-CA 1470, KMPC-CA 1540 and KEYF-WA 1050. The signals faded out around 1330 UTC. Japan very strong early afternoon, and a very short opening from New Zealand around 1140 with News-Talk ZB 1035 excellent signal. Also heard Kiwis on 1008, 1080, 783. Some Australian X-band. 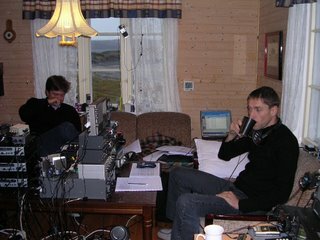 Members of the KONG16 team (apart from me) are Tore Nilsen, once before a KONG participant, and Torgeir Woxen, KONG rookie. Weather: Calm, snow, sleet, around 1C. Occasionally the sleet induced severe noise on the beverages; luckily those periods were few and short. Speaking of KONG16, Tore Nilsen and Torgeir Woxen should be here at 11 UTC but flight cancellations due to weather in other parts of Norway have delayed their arrival, and they won't be here until 20 UTC at the earliest. Since conditions disappeared rather unexpectedly (and no solar data seem to explain it), I went outside for a stroll and took the camera with me. This is what I saw. 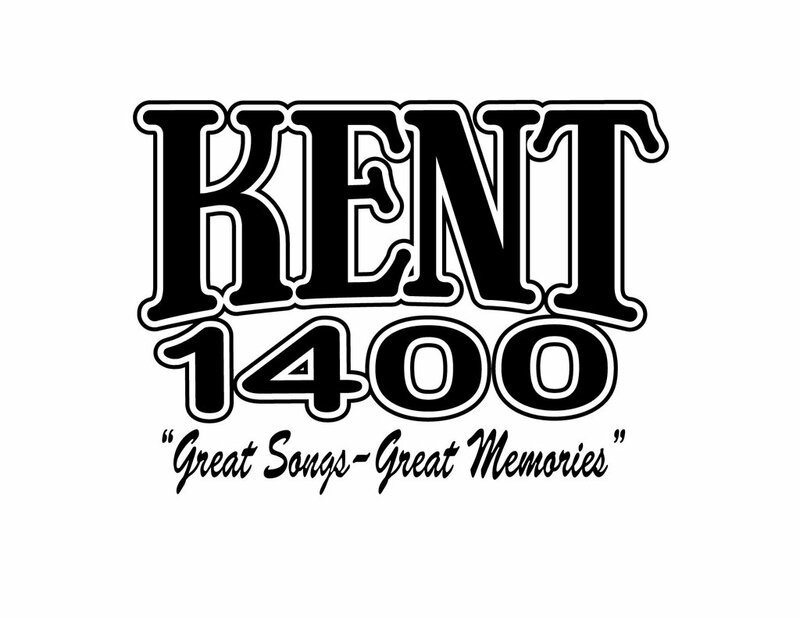 Partly good conditions Monday afternoon; KMED-OR 1440, KGOE-CA 1480, and KUBA-CA and KGST-CA on 1600. Good signals during the NHK2 ID at 1320. As twilight came, and passed into daylight conditions changed, for a period we heard just about everything from everywhere; from Newfoundland to Washington to Alaska, to Venezuela/Colombia and possibly Argentina too, on the same antenna. Later on the southern US states and Mexico came through well, such as KKOH-NV 780, XESJ-Saltillo 1250 and one "Radio Uno, 640" suggesting either XEHHI or XEYQ. At around 0730 most signals faded away, but we expect conditions to improve shortly. Weather: Cold, calm and clear, -6C. The Aurora was well visible last night, but at these latitudes there is a trace of Aurora even on the quietest of solar conditions. The effects of the Coronal Hole seem to have gone, as we are now back into real DX-ing. Nothing exciting during the first part of the night, but around 0245 UTC we noticed La Plata stations fading up; Monte Carlo 930 and Atlantica 760 to name a few, later on mostly Brazil with superb signals from 1360, 1560 and others. 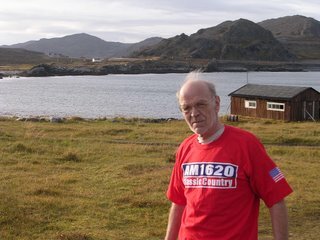 Mostly North America from 0430 onwards, KKGM-TX 1630 first out. Westerly oriented conditions including a lot of Mexicans, KLIN-NE and KENT-UT 1400 (the latter new on the air), and CBKD-AB 1560 (low-power CBX-relay). Weak signals as per posting, but we know that things can change quickly here. We're back in business! And then they were three... OJ took the 1335 plane from Berlevåg back home to Trondheim, due home 1830 (both local time). Arnstein, Tore Johnny and Bjarne will stay until Wednesday when another crew arrives. Not much to brag about this time - a small opening to the North American west coast this afternoon, some Philippinos later on, not much Japan. The effects of the Coronal Hole is supposed to wane over the next hours and days, so perhaps we're up and running again on Monday. There is a chance of a C-class flare from Sunspot region 10917 though; hopefully it will stay calm (see Solar Terrestrial Activity Report for details). 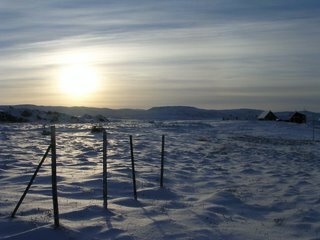 We have received some emails giving us feedback on the web logs on kongsfjord.no and arcticdx.com. We appreciate this very much, and we see from the increased number of pageloads that there is considerable interest in the DX community in what we hear (and eat???). We hope that the ionosphere allows us to continue to bring interesting reports out. Weather: Temperatures around 0C, calm but quite a bit of snow is falling. We're not quite certain about this. Signal levels somewhat low. We'll keep testing throughout the night, until the bottle is empty. 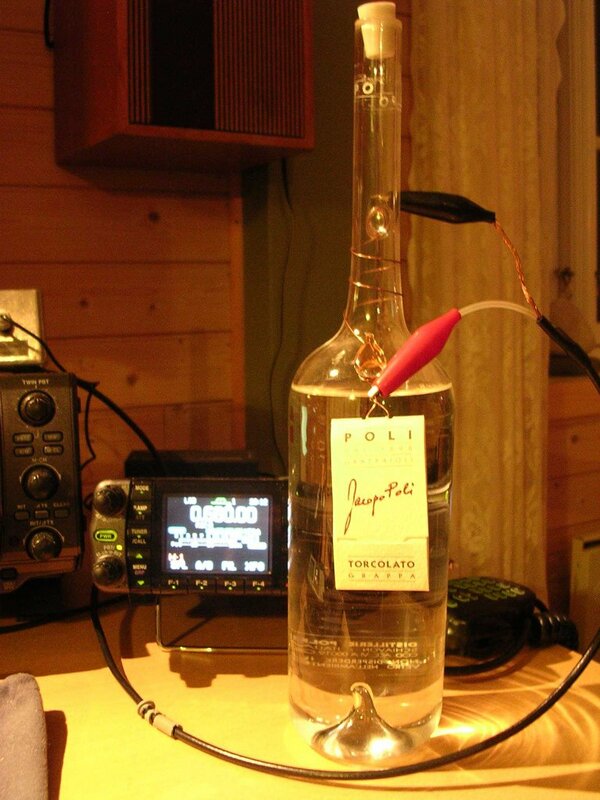 Not sure if this copper string around the bottle neck is for grounding purposes, or if it is a loop antenna. We will test this during the night. If we hear KBRW-AK on it, we will consider a major purchase for next year's KONGs. In defiance of the Coronal Hole, stations from North America popped up very early last night - WDEA-ME 1370 at 2200 UTC. Excellent signal strengths from around 2330 to 0030, mostly easterly stations. Then the signals became weaker, but we had reception more or less throughout the night and morning - nothing exceptional though. Asia/Pacific DX was less inspiring than the previous days, still we enjoyed 4QD-1548 with excellent signal levels, and 4QN-630 was there as well. We think we may have AFN Korea on 1440 and AFN Japan 1575. Typical for the disturbance, the lighthouse JOWF-1440 was soon replaced with CNR from Nei Menggu. Some India during the afternoon. But we were more focused on the reindeer sirloin dinner we prepared. As of writing, it is about to be served. Some really, REALLY hefty cheeses are for dessert. And vintage Port wine of course, and the world's best Grappa (with a copper grounding lead). Expect no more updates until the effects of all this have left the body. Well, well, well... or Jau, jau, jau as OJ would say. The equation Ionospheric disturbance = Poor conditions does not necessarily add up. As the high speed stream from Coronal Hole 244 increased in density and speed, we experienced another superb afternoon with reception from the Pacific. Most of the Fiji frequencies were in the clear with excellent levels, and we made further progress in our efforts to log New Zealand. Several frequencies were heard, some work is required to confirm the status for some of them, but in addition to the previous heard stations there were new logs of Newstalk ZB on 1296 and 1503 kHz (the latter possibly Radio Sport, Wellington, with overnight relay? ), and 1YA National Radio, Auckland 756. All three Guam stations (567, 612, 801) were heard; 567 and 801 stunning signals. Australia was rather modest though. I was away in Berlevåg most of the day so I missed most of the fun but did get 1296 and 756 when I returned. A good part of the evening was spent at Kongsfjord Gjestehus where OJ and Arnstein enjoyed "Probably the best lutefisk in the world" while TJ and Bjarne chose a more traditional lamb's steak after we had made our own hors d'æuvre from Parma Ham. 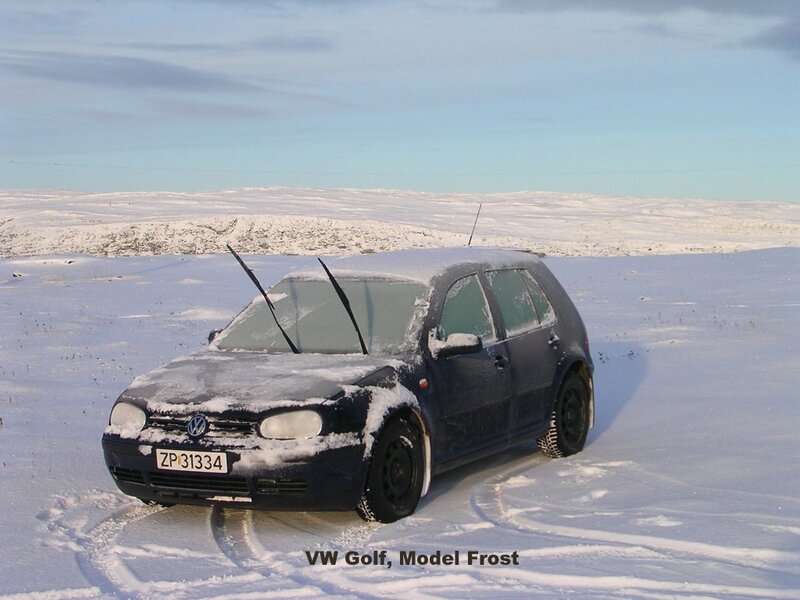 Weather: Cold! Gale force winds at night as I write this, -8C. Milder tomorrow they say, I hope so because the cellar with the water tank and pump is only 1C now and below zero could damage the pump. Waiting for the stream from the Coronal Hole we sat out to DX around midnight, but nothing much happened to the ionosphere so we had a good night's DX . Excellent signal levels, especially on X-band, but the usual dominants were unusually dominant (if you catch the meaning), so the number of "rare" stations was low. KSJB-ND 600 and WMT-IA 610 were heard though. Around 0900 UTC we started to hear a few Pacific stations like V7AB-1098 and some of the Fiji frequencies. Another highlight! Although there weren't many stations of interest from North America the past few hours, we did get a good opening towards New Zealand! The most common Kiwi, Newstalk ZD Wellington 1035, was first heard at around 1200 UTC, becoming stronger by the minute and occasionally armchair listening! Newstalk ZD also heard on 1080, and Radio Tarana 1386. Most surprising though was 2YB Access Radio, Wellington 783! Heard with BBC World News at 1230, continuing with BBC stuff up until 1300. I checked their Internet stream and could confirm that it was the same station. ID at top of the hour. No sign of Aussies but a lot of Hawaii at the time of writing. We are waiting for the high speed stream of Coronal Hole 244 to arrive within a few hours; it will probably kill the good conditions for a few days. High hopes for the night after the excellent conditions we experienced for parts of the previous 24 hours....duh. Very little excitement until morning when we began to hear a few rare stations. Broad areas were audible; CFAV-QU dominated 1570 at the same time as KGAL-OR dominated 1580. A couple of nice stations we heard were KVOC-WY 1230 and rather surprisingly KCBS-CA 740. Their night pattern is very unfavourable for us. We thought we might have a signal from KNBR-CA 680 under KBRW-AK as well. KBRW on the other side reported of another missing dog, this time a Pitbull/German Shepherd dog answering to "Strike For Me". Maybe it's the half-brother of the previous missing Rottweiler/German Shepherd "Stay Home"? If I was a Poodle owner in Barrow, I'd name it "Soon Dead". Weather: Light winds from the north, occasional snowshowers (making RF noise) and -2C. 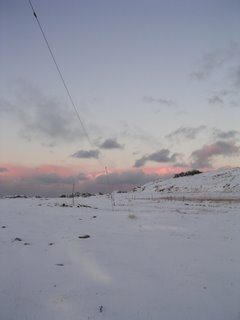 A thin layer of snow has covered the ground. Oh dear, oh dear. An East Australia opening going into the DX Hall of Fame. I'm really at loss of words, so for details, check the recent Kongsfjord.no KONG15 update. OJ is going to make fresh tuna steak rolled in leek ashes. I am not convinced that burning the leek up before you eat it is very wise, but he says it seems like a good idea. Some signals, not very strong though, when we first checked at 0230 - KKAR-NE good on 1290. An hour later the band opened up; good signal strengths and not least very weak Europeans. Best signals from the Lakes area; some of the better ones were WOAM-IL 1350, WHBL-WI, WVHI-IN and WTRX-MI 1330. Many, many hours of recordings need to be checked, the above are only from what we found when listening to a particular radio. Weather: Northerly winds of moderate strength, partly cloudy, snowshowers and 1C. 630 kHz, 1400 UTC: "This is Local Radio Queensland". 4QN Townsville!!! Awesome!!! The ionosphere finally calmed down enough for us to do some proper DX - starting Monday afternoon as TJ found an unmistakingly Australian voice on 1161 - 5BA Naracoorte. This brought about some frantic tuning on frequencies populated by SA and Victoria stations. "Only" 5AA Adelaide 1395 was found, at 1640 UTC, but with occasional good signal levels. Most welcome, and a new logging for us all. The rest of the evening and early night nothing much happened; around 0300 we heard some La Plata stations but soon the North American stations were the dominating ones. Examples: WTDW-MI 1310, KANN-UT 1120; later on both KELK-NV and KDLR-ND on 1240. At the same time strong signals from the Canadian Atlantic stations. Quite good conditions up until 1200 UTC with KKPZ-OR 1330 and strong signals from most Hawaiian stations, Fiji and Marshall Islands (1098). Weather: Changing from dry and calm (yesterday evening) to windy and rainy today, temperatures 3-6C. Another King Crab meal later today, this time with fresh white bread, mayonnese and whatever we have laying around. By popular demand (one email, if I remember correctly), here are some pictures from recent days. 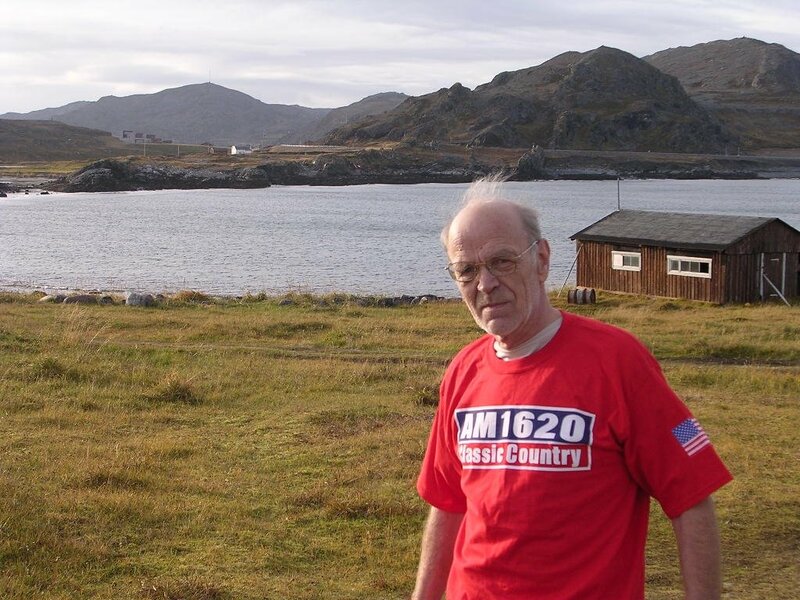 Top (KONG14): Tore B. Vik posing in a T-shirt supplied from WNRP Gulf Breeze FL 1620. He's trying desperately to make it look like a pleasant 25C when it's really only 2. Middle (KONG15): Arnstein Bue (left) and OJ Sagdahl. OJ's rack has been nicknamed "The Tower of Power". Bottom (KONG14): Ole Forr (left) and Jan Alvestad hunting Hawaii in bright sunlight. Tore's radios in front. The ionosphere works in strange ways. As I am writing this in the wee hours of Monday, the solar conditions have improved significantly, yet there is hardly a station to hear. While yesterday, with K-indices around 4-5, a tiny 1kW station on 880 decided that they wanted to be heard across the pole - hence the logging of KCMX Phoenix OR. Only 4-5 other stations audible at the time. How does things like that happen? Anyway, until the next corona hole arrives late this week we can only try to hear as much as possible. I received an email regarding the lack of photos on the blog. Like photos of the radio shacks, the food we constantly brag about, the wine we appear to be drinking all the time; the red-eyed, five-day beard DX-ers... enough said! No photos! Only joking. Actually I have a few photos but my Nikon camera suffers from the proprietary-usbcable-forgotten syndrome, effectively blocking any attempts to transfer files to my laptop. The camera's owner (that's me) suffers from the always-forget-to-take-cable-with-me syndrome every time he's back home in Berlevåg. Believe me, there is no known cure for this. Had there been a cure, you would have seen pictures of a dinner to remember - new-caught King Crab boiled in sea water with pasta carbonara. A delightful mix! We had a very nice Riesling white wine with the crab. Actually we forgot to make the hors d'æuvre (or antipasto which might have been a more appropriate term, the main course considered) but it was supposed to be served with a Cantina Zaccagnini red wine and we didn't forget that. And when we prepared all this we had a nice red from Argentina - Alamos. Weather has been mixed, right now calm, clear and mild (around 4C); on Sunday afternoon gale force winds, rain and sleet and 2C. A belated update with little news; the current corona hole has created quite a few problems for us. Not too bad on the night to Saturday though with occasional fair conditions towards North America, the highlight being KERI Wasco CA 1180 with good signals. Throughout Saturday we did hear some Japan, and in early evening strong signals from the Philippines. It seemed as if conditions were about to improve, but as of writing, the K-index is 4, solar wind is gaining speed and things look rather grim. For food lovers: We made an interesting variant of salmon last night; wok'ed wild salmon with Chinese sweet & sour sauce, and an excellent white wine, Estate Rauenthal 2005. Light wind, occasional rain and 3C outside. Recording media: Mostly Sony Hi-MD recorders, some iRiver flash and HDD MP3 recorders, PC via TotalRecorder. The expected solar disturbance hit during the night. Not much of interest during the morning except some Canada prairie and US northern border stations. This is the final report from KONG14, as KONG15 will commence later today. We have enjoyed excellent conditions and there are several hundred reports to be written - not to mention several hundreds of hours with recordings to check out! Weather has cooled off to just above freezing, with light snowfall during the night. Calm and nice though. Best regards from Jan Alvestad, Ole Forr, Tore B. Vik and Bjarne Mjelde! Watch out for the first KONG15 update, due later today! No daytimers last night as we had hoped for. Instead, we had quite a few Brazil/La Plata stations. Conditions towards North America fair througout the night, increased in strength from 0430 UTC onwards. Very spread though... one of us assumed the religious station on 1210 was KPRZ but ended up with VOAR! Some of the better catches include KWKY-1150, KCFR-1340, WFDF-910, KHNC-1360, CKGL-570, KKKK-1580, KTIK-1350, WAUR-930. Currently at 1015 UTC we are hearing an announcement on KBRW also heard by the Parkalompolo crew some days ago, namely the owner calling for his missing half-breed Rottweiler and German Shepard dog "Stay Home". Apparently, the name didn't catch. We're keeping our eyes open though. Sounds like a scary breed. If we find him, should we say "Go Home"? Excellent conditions this afternoon towards the North American West Coast and Australia! Some of the catches were KBRC-1430, KLKI-1340, KSLM-1390, KKPZ-1330. Australia well heard both in-band and x-band; ABC 855 resurfaced with good signals, 4QD-1548 armchair listening! Radio Brisvaani-1701 also well heard plus most of the other x-band frequencies. Excellent conditions from before 2200 UTC last night until around 0100. East coast stations came in very early, and some rare catches too, like WNYY Ithica NY 1470 and one very interesting prospect which needs to be checked out first. Signal levels were very good - alas the good times didn't last and the rest of the night and early morning was much less rewarding - although conditions weren't bad at all with WJMC Rice Lake WI 1240 at 0620. Weather is excellent for staying indoor - strong southerly winds and rain, temperature 3C. The good conditions returned. At around 7 UTC to 11 we enjoyed good signals from the western part of North America. Nice id's from stations like KPUG and KJOC 1170, KMAX 840, KPRZ again on 1210, and the graveyeard frequencies were swarming with life - unfortunately most of them familiar to us, like KKEE-1230, KEJO-1240 and KONP-1450. Later on Alaska and Hawaii had good signals, nice ID from KQNG 570 and we believe that KMVI-550 was there as well. Interesting UNID Spanish-speaking station on 1260, mixed with CFRN and (presumed) KPOW. And, as we write this, Fiji 1152 is at full strength! High expectations for the night when Sociedad da Bahia 740 was heard as early as 2100. But suddenly: Nothing happened! And nothing happened for a very long time, in fact signal levels didn't rise to "DX-able" until 0230. Conditions not very interesting though with mainly Canadian/US prairie, stations that are quite common here. A few interesting exceptions like WGY on 810, and we may find the odd graveyard station when we check the recordings. Weather-wise it is still nice and calm for October; Partly cloudy and dry, calm to light winds and 4-5C at day, 2-3C at night. A very good night. Although conditions were wide-spread as previous days, signal strengths were much better. It started off around 2300 UTC and lasted until around 0600 when signal levels started to wane. Good catches include KBOW Butte MT 550, WIND Chicago IL 560, WKBN Youngstown OH 570, WNAX Yankton SD 570, KPRZ San Marcos CA 1210. Several frequencies were monitored more or less overnight, like 1240 and 1230, so there are likely quite a few surprises in hand for us. This recovery from the disturbance was surprisingly quick and may indicate that we have more interesting days and nights ahead. What a strange DX day. Conditions really turned worse during the morning and well beyond noon. Even the Japanese powerhouses like JOLF-1242 and JOIF-1413 were either absent or weak. Then all of a sudden things are turned upside down. Not only were the Asians back to thir usual strength, but prior to 15 UTC several Fiji Islands frequencies came up with excellent signals. 810 and 684 were particularly strong. At 15 I had placed one of the receivers on 855 more or less by chance. Imagine my surprise when this full-hour id came: "This is Local Radio Queensland"... Apparently the 10 kW Eidsvold transmitter. Don't think it's heard in Europe before. At the same time The Cornerstone was heard from Saipan on 1080. Interesting development this night. A forecasted Coronal Hole stream was relatively weak, but noticeable. Stations began to fade in very early yesterday evening but no daytimers were heard. Around 01 UTC we had a short but very hectic spot-opening towards Illinois with excellent signal levels. 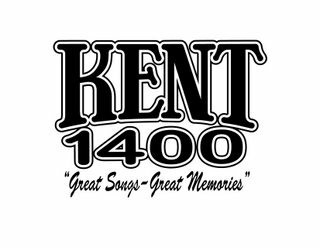 WSDR Sterling IL 1240 up a few minutes with ID and Oldies music. Later on conditions were rather standard post-disturbance with stations from Idaho, Wyoming and Montana dominating together with the more common Mexican stations. No improvement in signal levels in the morning though, and at 09 there are very few (and weak) stations left. The ionosphere appears to be recovering quickly though, and we are ready for Pacific stations anytime! Weather: 5C and light rain, moderate winds overnight; 7C, light rain and calm around noon. Expected colder and increasing wind Sunday afternoon. Fair to good conditions towards Pacific this afternoon, although Asia at large was a disappointment. Good signals from Fiji on 1152, 1467 and 810 (new). Marshall Islands 1098 also surfaced, and somewhat surprisingly a steady signal from KORL Honolulu HI 1180. KORL has swapped calls with KHCM. Good signals from most Hawaii stations. Good signals also from Alaska, with KRSA Petersburg the best logging. A solar disturbance is in progress as I write this, so we're a bit uncertain how conditions will develop overnight. And yes, the King Crab was delicious! Another night and morning with very wide-spread conditions. Started at around 23 UTC with the common East Coast stations - throughout the night most of the Americas was audible on the same antenna. Venezuela-920 and a mix of CHAM, WBAP and KGNW simultaneously on 820. Signals began to fade after 7 UTC and as of writing, 9 UTC, only the strongest West Coast stations + some Alaska is audible. 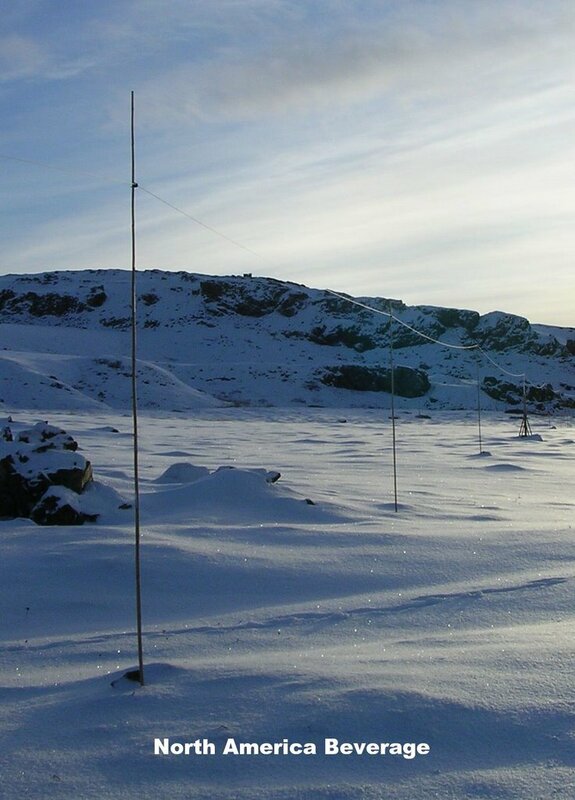 Some of the antennas pick up more noise than others - we don't know yet if the problem is internal or external. Hoping for some good signals from Asia and the Pacific later on! Weather-wise it's a bit windy, partly cloudy and day temps around 5C, night temps just above zero. Relatively weak signals early night, and spread from all over the Americas. La Plata, Venezuela, East Coast, West coast - all on one antenna! Few exciting catches but as we approaced sunrise the signal level increased especially on the graveyard channels. Around 7 UTC the signals seemed to die out but later on increased signal levels from West Coast, Alaska and Hawaii - although nothing spectacular. Early afternoon good signals from Japan during NHK2's local ID slot at 1320. The rather short 310-degree beverage worked well with little Loran C interference (the local plague), while the longer 333 and 30 degree beverages needed some attention befor they got going. 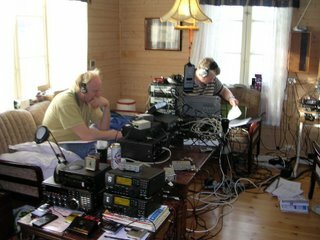 Stations like KMON-560, KJRB-790, KUMA-1290 were heard, and we also heard CKDO 1580 talking with Lemmenjoki participants. Weather is very nice, clear skies, a light breeze and day temperatures around 4C, at night it drops to below 0. The outlooks seems to be good so we're getting some sleep to be ready for a new night. I have compiled a four-page review of the IC-7000 postings I wrote on this blog. It is available on our Kongsfjord page, or you can use the link under "Some DX Related..." etc. on the right panel. Although I have had no ambition to cover every aspect of this excellent radio, I hope that you find it useful. WMT Cedar Rapids IA 600 email from the guy who voiced the promotion I heard (Randy Lee). XECB La Ranchito, San Luis Rio Colorado 1460, email from Eduardo Acosta Sanchez. Maybe my best Mexican catch to date - only 1 kW nights. KJOX Yakima WA 1390 email from their GM, Greg Dourian. Tnx Ole Forr. The KONG14 crew is scheduled to arrive Thursday evening around 21 UTC. Both this blog and kongsfjord.no will be updated at least a couple of times a day throughout. Outlooks are very good! 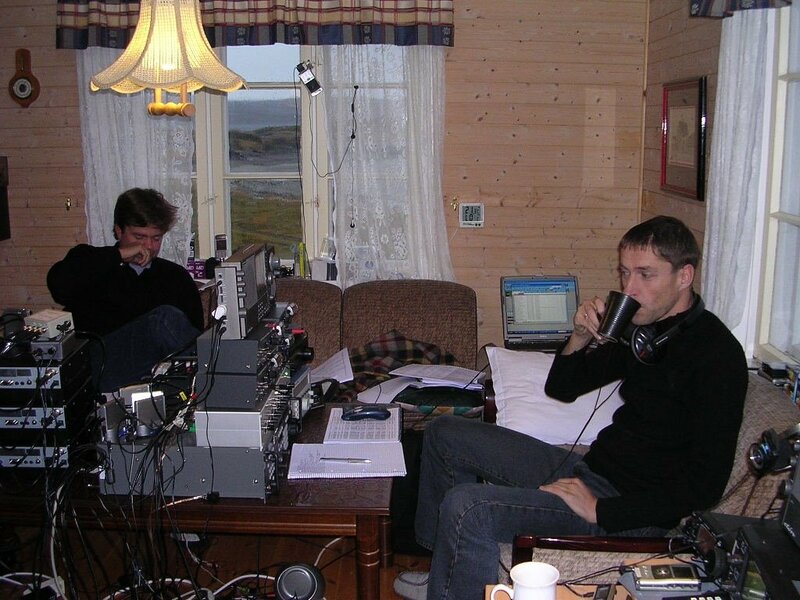 Awaiting the stream from Coronal Hole 241 I set out to Kongsfjord to erect the two last beverages for the upcoming KONG DX-peditions, and to do some DX. OK signals from North America until the disturbance set in at around 0300 UTC when they faded in favour of South America, mainly Venezuela but some La Plata as well. North American stations returned around sunrise 0400, but very broad (from Ontario to the West Coast) which rarely brings in anything new. Still, at 0505 I heard a good signal from WTVN Columbus OH 610, new, through the Loran C noise. I sent a report a few hours later and received an email verie yesterday evening, only 12 hours after I had heard it. Most stations had faded out around 0600, two hours after sunrise.